Immerse yourself in the natural and refreshing water of Gastein. As soon as you drive into the Gastein valley in the Salzburger Land, you feel that water plays an important role here. The Gastein Ache, thermal spas, mountain lakes, streams and the famous waterfall in Bad Gastein are just some of them. There are many ways in which the water makes its way down into the valley. Swimming enthusiasts will find many ways to pursue their hobby here on summer or family vacations. 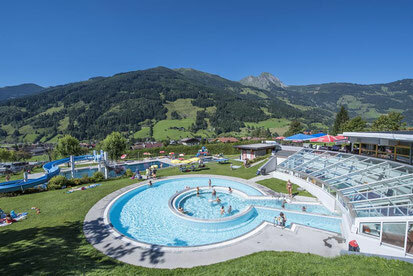 The solar bath in Dorfgastein is a great place for the whole family with several slides and saunas. The bathing lake between Bad Hofgastein and Bad Gastein is in summer, on hot days a popular destination in a holiday with children and provides with its pleasantly cool and natural water for refreshment. 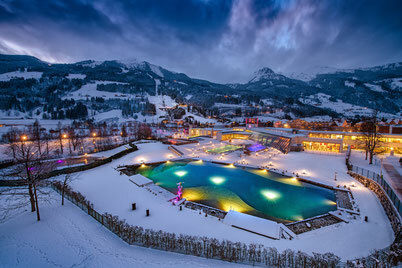 Something unique are the two thermal water lakes in the Alpentherme in Hofgastein. 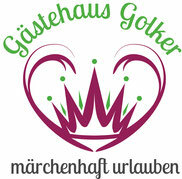 And right in the immediate vicinity of our guesthouse Golkers is the Felsentherme Bad Gastein. The brave may venture the jump into one of the fresh mountain lakes after a strenuous hiking tour. No matter where you go, you can enjoy the view of the picturesque landscape and up to the impressive summits of the Hohe Tauern. Perfect for a break from city life, draw energy from the alpine nature in Bad Gastein and enjoy relaxing moments of well-being in the province of Salzburg. The interior of the spa blends in wonderfully with the surrounding mountains through its imposing cliffs. Through the large windows and from the outdoor pools you can marvel at the Gastein mountains and feel the calming power of the mountains. The numerous basins of the Felsentherme are filled with the famous Gastein thermal water, which is slightly mineralized and wonderfully relaxing. including a massage. Or to revamp his body in the Felsentherme gym. The alpine water worlds of the Alpentherme Gastein in the Salzburg area leave nothing to be desired: those seeking peace and adventure-seeking spa guests will get their money's worth in the modern spa in the Salzburg region. Spas, sauna, massage, sports, facials and cures for your health and well-being: this is the offer of the Alpentherme, one of the most beautiful spas in Austria. In spring and summer, the Alpentherme Gastein is the right place to wake up spirits. the power of nature, the purity of the water and the pure energy that fuels the body with it. They are unique and genuine - because they are filled with real Gastein thermal water. The two lakes with 1,300 and 370 m² of water surface are filled with the treasure from the Hohe Tauern. Every day, 150 m³ of fresh thermal water gushes into the lakes. Unique and pure because they are without the addition of chemical substances such. Chlorine be cleaned. The water is purified by a biological filter system. The Alpen-Solarbad, located just a few meters from the valley station of the cable cars, offers you bathing pleasure of enjoyable nature in 26 ° C to 28 ° C warm water. The bathing facility is located in the sunniest part of the Gastein valley and is THE family bathroom! Hot water, exercise, sports and children's pools; Giant water slide; large playground and lawn; Solarium; Sauna await you. Come, whenever you want, whether in the late morning or after an eventful hike, the stay in our idyllic solar bath facility is always recovery, relaxation and experience.